My 12th-grade girls are starting to narrow down their college choices. Even though they are twins, they do not necessarily want to go to the same school. College visits are so educational. Like at Smith, our tour guide described how students could receive grants. And so she, having just completed research about how exercise increases brain function, petitioned the school for treadmills in the library. And now, there are treadmills in the library, which has helped students study better, longer, healthier. Young people are so inspiring. This is why it is awesome to be a teacher and a parent right now. The leadership in the U.S. is sorely lacking. People need inspiring, moral leaders. (Those who claimed to want to drain the swamp are the new swamp monsters, yesterday’s CNN opinion piece says). At many other schools this summer, we visited the beautiful libraries. This is a perennial highlight of the college visit: the library. 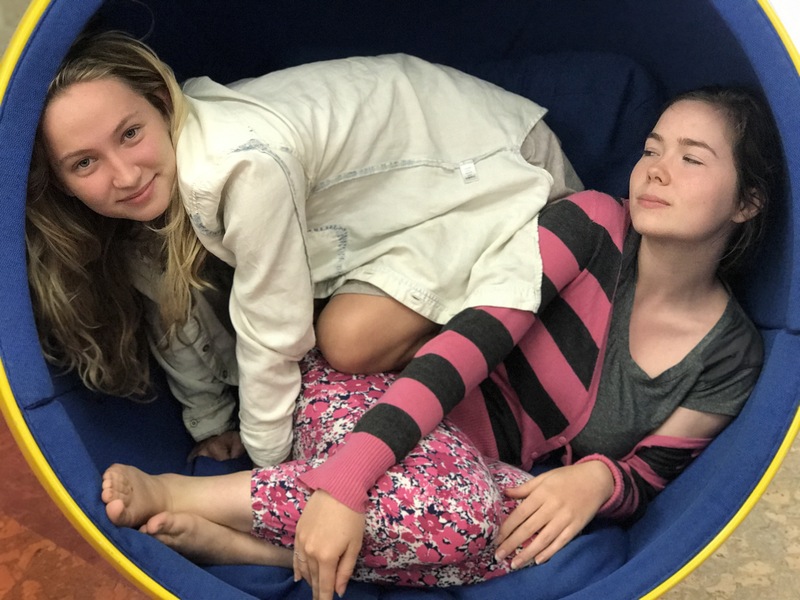 At Oberlin College, my girls crawled into a womb chair in the library. But it was not my womb chair. From my comfy nook, they emerged nearly 18 years ago, kicking and screaming. Only suddenly, they will be plunked down from their childhood into new places of growth, new libraries. To be inspiring and to be inspired. To take over and to never give up. I hope. The womb chair where the girls tried to get into their in utero positions. We also visited a spot on campus where you could decompress by playing with kittens. College visit with our great friend Alex.